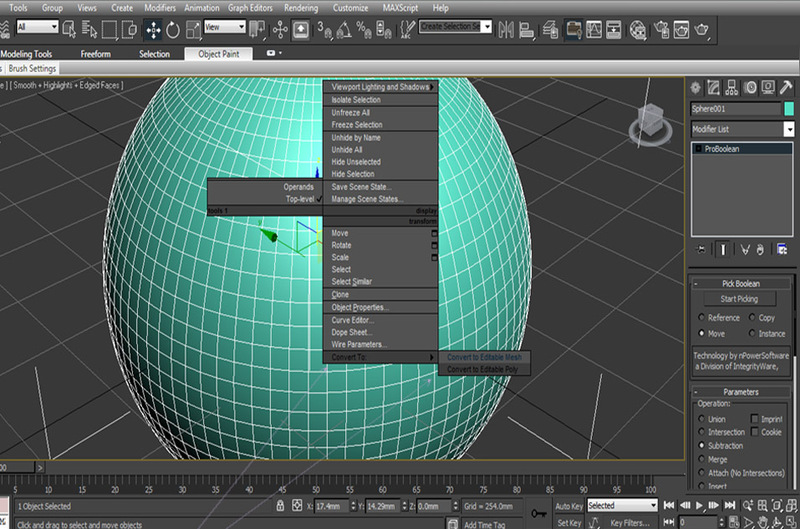 Today was the second session of training of 3D Studio Max. Today we learnt further key features of the software and developing what we learnt in week one and progressing learning new techniques. 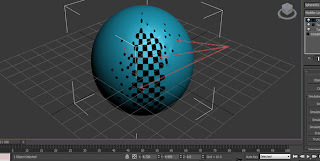 I have been working on the online tutorials since the first session so using what I have learnt from the tutorials enabled this session to go a little better. Due to the short space of time we are having these sessions taught to us, it feels like very little time to be able to grasp an understanding as to how we can use this software and implement our design ideas into the tools and features available in 3D Max. By selecting keys ‘F4’ & ‘F3’ enables a grid selection to be visible around the object. This enables editing to be more accurate. 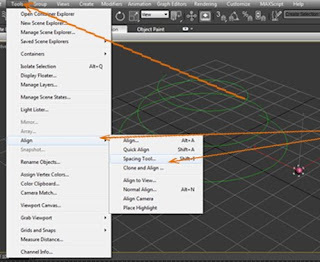 By selecting and increasing the segments, enables more grid sections of smaller scale. To enable editing to begin of an object it needs to be converted into an editable poly, this enables sections of the object to be manipulated and edited to a desired effect. 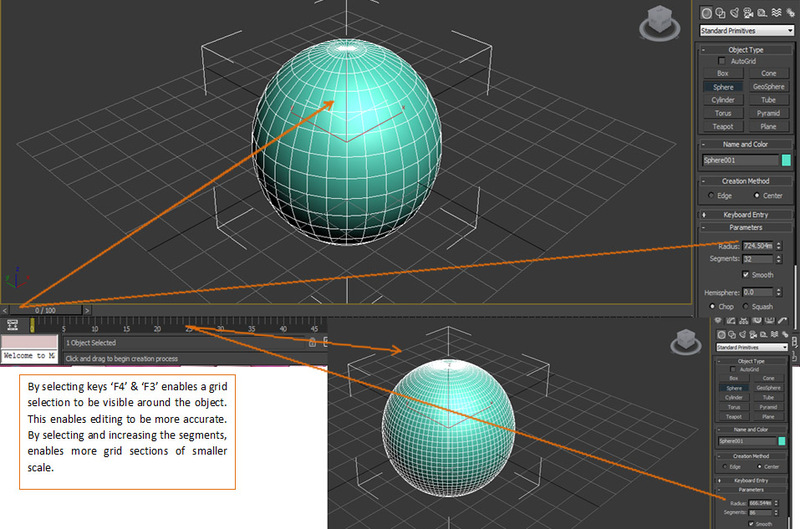 By simply right clicking and converting the object to editable poly, will conver the object into an editing mode. To be able to cut through sections, firstly once the object is converted to an editable poly, selecting the polygon tool which is highlighted in red/yellow; individual sections can then be highlighted and by clicking on the delete button on the keyboard, the highlighted sections are cut away. 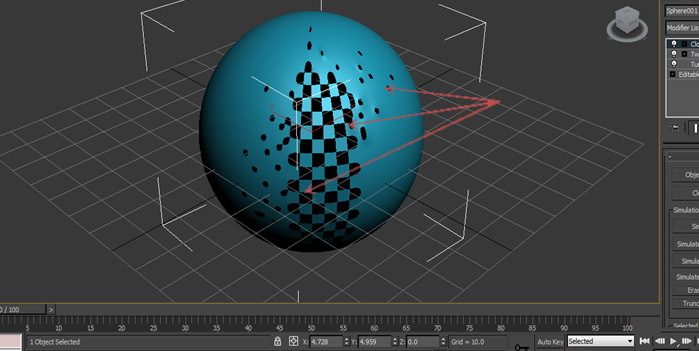 The cut through technique is highly effective, It creates a new dimension to an object. However when cutting through an object the implication is that if a design was to be printed as a prototype,then there needs to be a structural support for each segment. The following construction has been cut resulting in no solid structure of the individual shapes, therefore making it impossible for the following cut through object to be printed in to a 3D structure. 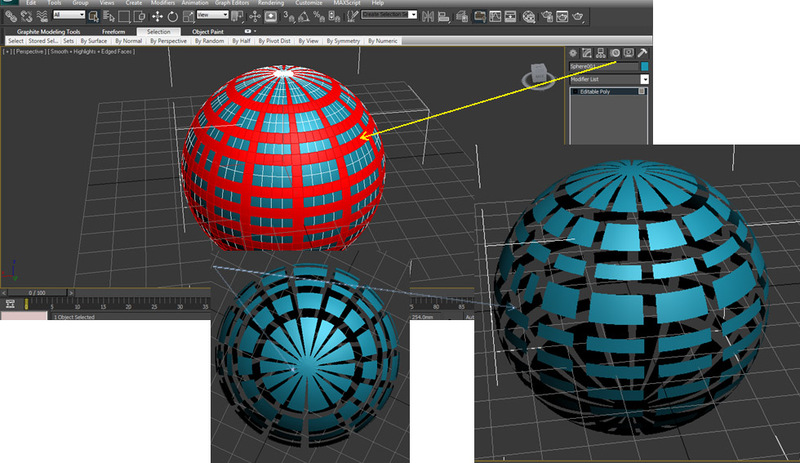 The cut through has been acheived here by selecting the vertical and radius contours of the sphere, using the editable poly process as stated previously. 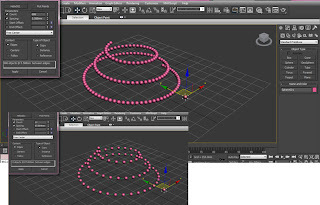 Firstly using the shapes tools, I drew out a helix shaped and using the parameters I edited to create a helix of over 2 turns creating a spiral. 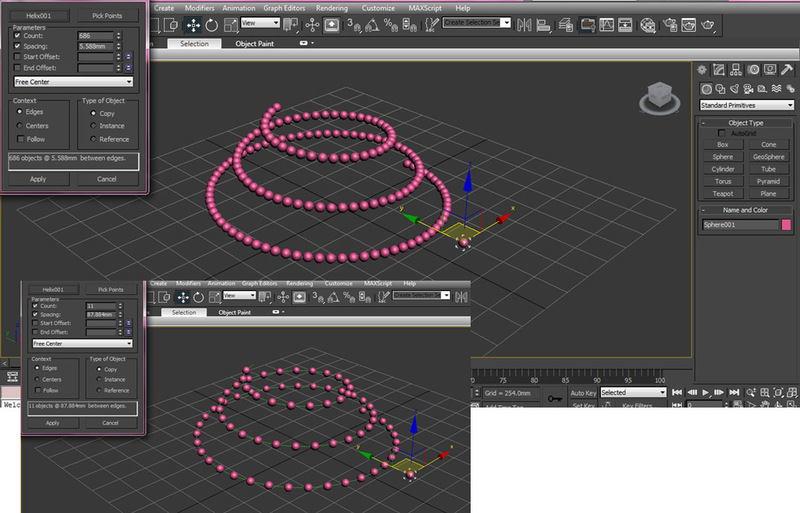 by selecting tools, align, spacing tools, will then enable me to begin constructing the sphere around the helix. By altering the space and object count, we can see how the design construction changes. 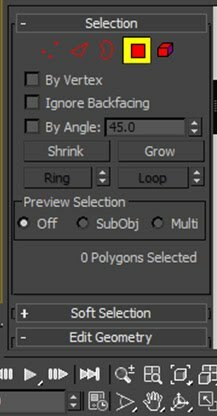 This is a very interesting design feature, and works effectively.